Image caption John McAfee has said he will decrypt the phone "for free"
Anti-virus software creator John McAfee has said he will break the encryption on an iPhone used by San Bernardino killer Syed Farook. Mr McAfee made the offer to the FBI in an article published by Business Insider. Apple has refused to comply with a court order asking it to unlock the device, dividing opinion over whether the firm should be compelled to do so. 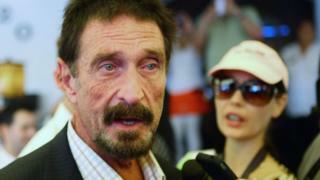 Mr McAfee said he and his team would take on the task "free of charge". The offer came as Mr McAfee continues his campaign as a US presidential candidate for the Libertarian Party. "It will take us three weeks," he claimed in his article. Security expert Graham Cluley told the BBC he was sceptical of Mr McAfee's claims. "The iPhone is notoriously difficult to hack compared to other devices," he said. For instance, Mr Cluley cast doubts on Mr McAfee's idea that he could use "social engineering" to work out the pass-code of Farook's locked iPhone. This is a process by which hackers try to find out login credentials by tricking people into giving them away. "In a nutshell, dead men tell no tales," said Mr Cluley. "Good luck to Mr McAfee trying to socially engineer a corpse into revealing its pass-code." "The FBI isn't interested anyway, they want to set a precedent that there shouldn't be locks they can't break," he added. In his article, Mr McAfee stated that he was keen to unlock the device because he didn't want Apple to be forced to implement a "back door" - a method by which security services could access data on encrypted devices. Chief executive of Apple Tim Cook had previously said in a statement that the firm did not want to co-operate. He argued that introducing a back door would make all iPhones vulnerable to hacking by criminals. Mr McAfee believes that it would be possible to retrieve data from the phone by other means - though he did not give many details of how it would be done. "I would eat my shoe on the Neil Cavuto [television] show if we could not break the encryption on the San Bernardino phone," he added. Some, including the Australian Children's eSafety Commissioner who spoke to tech website ZDNet, have said that Apple would not necessarily have to introduce a back door, but that the firm is only being asked to provide access to a single device. Other tech firms have rallied behind Apple's following a few days of debate over how it should respond to the FBI's request. Google boss Sundar Pichai had already expressed his support for Mr Cook and yesterday chief executive of Twitter Jack Dorsey added his approval via a tweet. In a statement, Facebook said it condemned terrorism and had solidarity with the victims of terror, but would continue its policy of opposing requests to diminish security. "We will continue to fight aggressively against requirements for companies to weaken the security of their systems," it said. "These demands would create a chilling precedent and obstruct companies' efforts to secure their products."